8.70 points at 79 votes (rank 11). 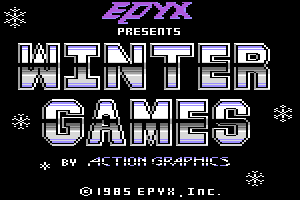 After Summer Games and Summer Games II Winter Games was released in 1985, the 3rd game of the "Games"-Series by Epyx. The game can be played with up to 8 players, which altogether compete in 7 events. The players get points in each discipline. For each gold medal, you get 5 points, for each silver medal 3 points and one point for the bronze medal. The player with the most points wins the game. In this sport your skill and precision on skis is tested. To be able to perform another trick, the joystick needs to be brought into the neutral position. To manage to make a trick and a somersault the corresponding direction needs to be pressed almost exactly as long as it takes the pawn to perform it. For Biathlon not only condition in the ski run is required, but also exact timing on the shooting grounds. There are 20 shots to be triggered. The aim of this discipline is to absolve the track as fast as possible without any mistakes. At Figure Skating the artistic execution of jumps and pirouettes is crucial. The mandatory or short program lasts exactly one minute and the figure skater needs to conduct seven mandatory elements (s. table of points). The aim in Figure Skating is to reach the dream mark of "6.0" from the jury. Only the first execution of a figure counts. Each fall is punished with a reduction of points. For sloppy execution (e.g. notchy jump / landing with both legs) each 0.2 points are subtracted. Joystick left: if the jumper is leaning too much to the front. Joystick right: if the jumper is leaning too much to the back. Joystick up: If the jumper has his knees too close to the body. Joystick down: if the skis are crossed. In the upper right corner of the screen the jumper is shown augmented to correct the posture. With a nice posture also the distance is better. The correct posture is reached, when the jumper puts his arms close to the body. If you aim for getting the skis into the typical V-position, you will not be successful: at the time of the winter games in Calgary the skis were still aligned parallel to each other; the "V" came many years later. After the jump just turn the joystick steadily clockwise with the right speed. This works only seldom, but is rewarded with a great distance and 20 points for posture. At speed skating two skaters run directly next to each other in seperate runways. After the "GO" signal the athlete has to cover the 250 meter track as fast as possible. always keep the speed display at the maximum. the basic for the best time is a perfect start. Free skating lasts exactly two minutes and the choreography can be chosen arbitrarily. You can do the seven figures each three times. The elements are only evaluated, if they have been conducted successfully. The aim here is also to reach the mark of "6.0" from the jury. For sloppy execution (e.g. notchy jump / landing with both legs) each 0.2 points are subtracted and every fall is punished with subtraction of 0.5 points. In theory, you can reach 6.9 points, in this case 0.2 points for every fall and 0.1 for each clumsy execution are subtracted from 6.0. At Bob Sled the player drives down audaciously the ice canal. Each wrong steering manoeuvre can lead to a bad crash. The player with the lowest time wins the race. Each of the eight players can choose one of 18 nations. After that the national hymn is played. To get a mark of 6.0 at Figure Skating, you need to fall at every flag (joystick down + fire). The use of this cheat is of course not allowed for the highscore list (a question of honour!). To avoid having to make corrections during the jumping phase at "Ski Jump", just turn the joystick at "the right speed" in circles. Of course, this does not always work (because the speed is always a bit different), but it is possible that way. Werner: "The disciplines Hot-Dog, Biathlon and Ski-Jump are just great." Guybrush: "A real classic which unfortunately only gets 9 points from me due to the two nutty and unrealistically realized ice-skating disciplines." FXXS: "Really a pity that one has to struggle with Free Skating and expecially the Figure Skating, other disciplines (as e.g. Slalom from World Games) would have been clearly the better choice. The remaining 5 disciplines are just enough to reach 8 points when playing alone. As a tournament game it is as all "GAMES" almost unbeatable..."
Darkstar: "A game with much fun, especially when playing it in multiplayer mode. 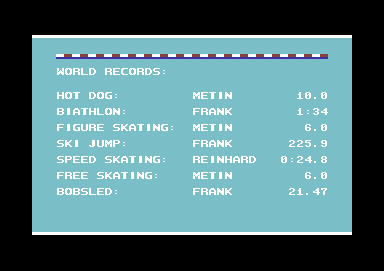 It is only a pity that sometimes you have got the hang of a few disciplines, so you get always full points (Hot-Dog, Figure Skating). However, the game gets 8 points from me." mombasajoe: "Without Figure Skating, but instead with e.g. downhill it would have been a 10 for me. This way I give "only" a 9." Shakermaker303: "Oh yes, I was not the only one who hated Figure Skating. But everything else is top! The graphics are very appealing, I always felt like winter holidays :-), I was especially taken by Biathlon. The nice idea with the heartbeat when being exhausted, when you were at the shooting stand, the design of the landscape... I loved it! Everything can be controlled and played well (exception: Figure Skating). All in all WG is a must, for the C64 fan." Quapil: "THE multiplayer game of its time, at least in my circle of friends...and of course without Figure Skating ;) I like playing it today from time to time. But it is most fun when played with the original hardware. 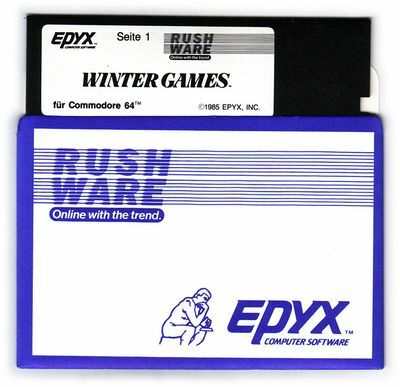 From me 9/10 and the hint, that the Games Originals by Epyx load unbelievably fast, no idea how Epyx could have programmed such a fast fastloader so early." Shmendric: "Fast fastloader? I hated the game due to the permanent loading. But the graphics and fun factor are without doubt top." MontyMole: "The Figure Skating disciplines bring down the overall impression a bit. Fortunately, you can also leave them out in the tournaments. Through this, the game gets a bit too short. But I like it better than Summer Games. The controls are in the meantime significantly easier to learn. 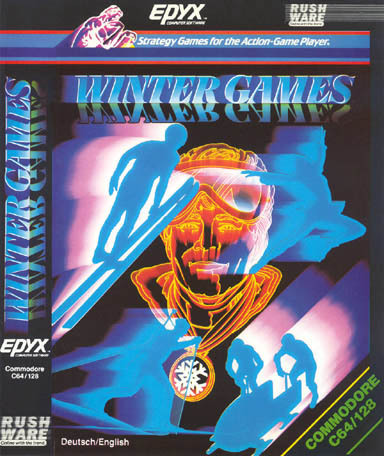 Winter Games is next to California Games my favourite of the series." 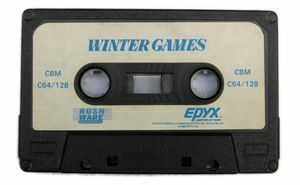 Winter Games "takes place" in Calgary Anno 1988 according to the manual, but Epyx had no official licence of the IOC for Summer Games, Summer Games II and Winter Games. 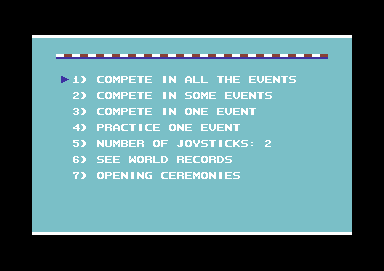 So they are no real "olympic" games, but only based on them. This page was last modified on 24 October 2018, at 06:23.